So now Mandriva 2005 LE is installed, and the teething troubles solved, and (almost) everything's running nicely. So what have we got? This snapshot shows Mandriva 2005 LE running with a variety of different things going on. In the top-left is the Mozilla browser showing a familiar page. In the middle-left is Eclipse, a java IDE. 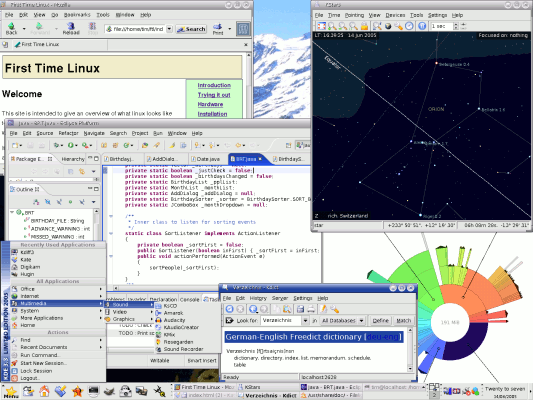 Top-right is KStars showing the night sky, and bottom right is Filelight showing a colourful view of part of the file system. Bottom middle is KDict looking up words in a German-English dictionary from a local Dictd server. Bottom left is the main Mandriva menu opened up to show some of the other applications available. The taskbar at the bottom looks very similar to the Knoppix one, because they both use KDE. Update: Obviously this 2005 screenshot doesn't represent the current state of the system - for the latest Debian screenshots see the Debian Squeeze live review or the Debian Squeeze installation page.